Cutting edge design, quality heat treated materials and competitive pricing is the winning combination for the increasingly popular Swift Chain. 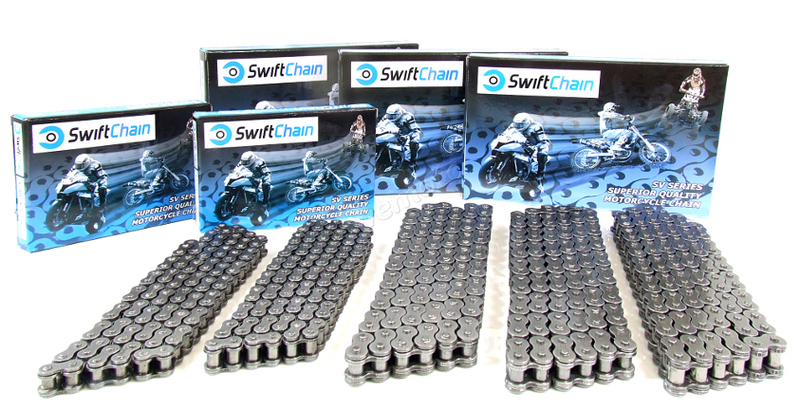 The manufacturers of Swift make original equipment chain for many motorcycle producers and this same level of excellence is accessible to the aftermarket through Swift Chain. From Standard, Heavy Duty, Heavy Duty O-Ring, to the new and exclusive Heavy Duty SX-Ring chain and available in a variety of pitches and cut lengths – Swift makes quality chains for almost any type of motorcycle. Offering a very similar — if not greater — tensile strength than many premium brands, Swift Chain publish the specification of its chains so you can see how it compares. X-Ring chains feature seals that have more contact points than O-Rings, helping them to retain greater levels of lubrication while keeping dirt out. The X-Ring dramatically decreases the level of friction and wear. O-Ring chains feature seals between every link which help to retain lubrication and reduce wear. When well maintained, they will last a lot longer than unsealed chains. The latest premium quality chain from Swift Chain, available with gold or silver colour plating. 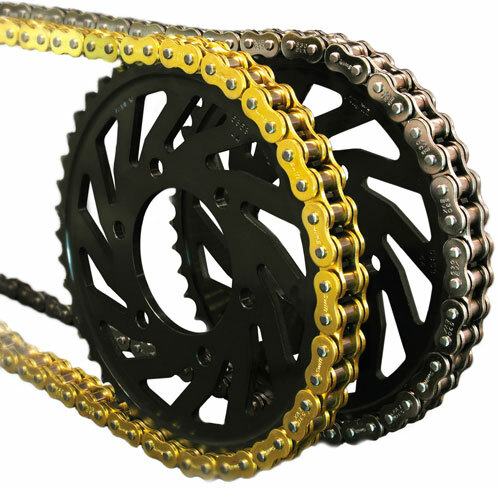 Swift's SX-Ring chain features X shape seals between the inner and outer plates of each chain link. While all sealed chains retain higher levels of lubrication than unsealed chains, the X-Ring excels at it with four points of contact as opposed to the two that an O-Ring provides. The cutting edge design of the X-Ring enables it to twist inside each link, dramatically decreasing the level of friction and wear. 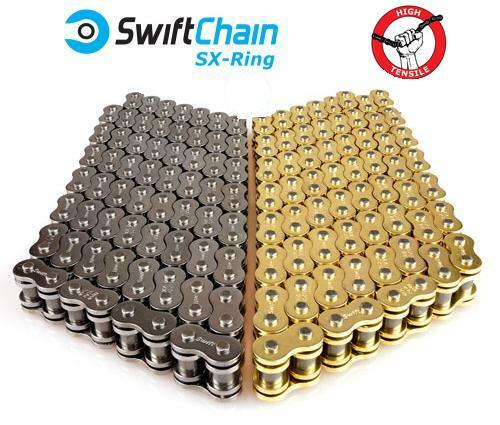 For those looking to get better performance and longer life from their chain, Swift's SX-Ring chain is the way to go. Available for a wide range of popular Japanese and European models up to 1400cc and available with gold or silver plating – they are guaranteed to look good on any bike. Full specifications for the chain can be found on the Chain Spec.page. All Standard, Heavy Duty and Heavy Duty O-Ring Swift chains are provided with one spring or rivet link. Swift Super Heavy Duty SX-Ring chains are provided with one rivet link. Rivet links require a riveting tool to install and, when installed correctly, have the same strength as any regular link in the chain. Spring links are not as strong as rivet links but are easier to attach and remove. 'Press-fit' spring links require tools (such as mole grips). Always fit spring links with the closed end facing forward. Spare links are sold separately. Always use the appropriate tools to prevent damage to the connecting link. It is highly recommended to replace your sprockets at the same time as replacing your chain. This is because the modified tooth profile of a worn sprocket will cause premature wear to the new chain. All chains (including O-Ring and X-Ring) require lubrication to be reapplied periodically. It is recommend to re-lubricate a chain at least every 300 miles.